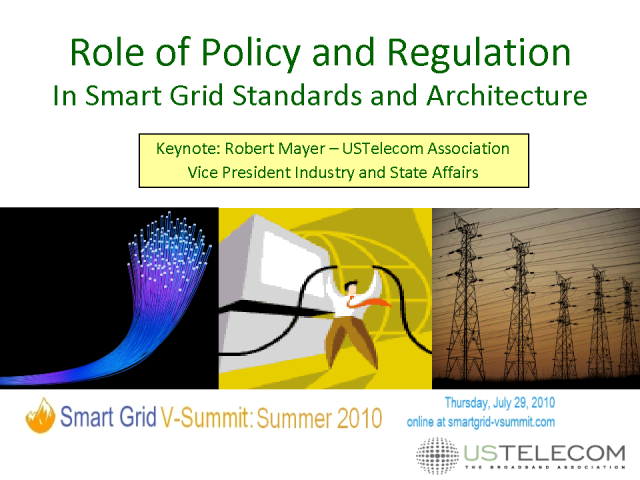 This keynote address will examine the major policy and regulatory issues that are expected to define the nature, pace and scope of smart grid deployment in the United States over the next several years and beyond. Issues regarding federal and state jurisdiction will be explored with particular focus on how decisions could impact architecture, market players, access to and use of utility and customer information, interoperability and Cybersecurity standards and cost recovery mechanisms. In addition, several recent decisions by regulators provide important insight into what factors are most likely to determine how technology will be deployed. This session examines how smart grid applications like demand response can help manage the distribution of electricity while lowering energy consumption, reducing cost, and cutting greenhouse gas emissions. Innovative smart grid technologies have enabled an increasing number of demand response resources to provide ancillary services to grid operators and utilities by making it easier for end-users to respond to dispatch signals quickly and automatically. We will look at one case study of an innovative pilot project designed to demonstrate the capacity for water systems to provide demand-based ancillary services, such as system regulation, to Ontario's Independent Electricity System Operator (IESO). We will also discuss several other case studies where demand response is providing spinning serves, like PJM's Synchronized Reserves Market and ERCOT's Responsive Reserve Market. This session -- a continued discussion of issues brough up in the previous panel -- examines key requirements for broadband network and HAN deployments as they pertain to smart grid. Panelists will critically review and compare enabling technologies and network alternatives, with an eye toward accelerating smart meter deployment and its associated benefits. We will hear from a municipal utility with deployment experience in this area, focusing on best practices, lessons learned, and success strategies moving forward. This session will explore options utilities have for building out the most critical infrastructure of an intelligent grid - the field area network. The choices made here will be fundamental for any utility modernizing its grid, as well as the broader vision for a centralized national smart grid. A key focus will be assessing the extent to which the worlds of IT, data networks and telecoms have a role play in helping energy companies achieve this pursuit. This session examines the requirements that are being developed to ensure smart grid cyber security, when those requirements will become mandatory, and what can be done now to offset the cost and effort of meeting future security requirements. We’ll look at how utilities can best implement a cyber security foundation for distribution automation, as well as strategies for managing the security risk for smart grid deployments. This session looks at where we stand with implementing the smart grid: deployment strategies and lessons to date, customer interactions and education, launching the initiative, impacts on end-user IT and data centers, and how best to achieve a smooth transition to an intelligent energy infrastructure. There are a number of pioneering technology developments that promise to help make the smart grid a reality. These include energy storage, AMI advances, synchrophasors, demand shifting, IP Smart Objects, and others. This session takes a close look at some of the more important technology innovations, where they stand in terms of deployment, and what we can expect moving forward. The speakers will draw upon case study data and field experiences to date in discussing the opportunities and obstacles facing these promising technology strategies. Sonoma Innovation, NERC, NEMA, Hypertek Inc. This session will examine the status of work toward an open, interoperable, and reliable smart grid. We will look at recent standards progress, the work of key regulatory and policy-making bodies, and the likely direction of important industry initiatives aimed at making the smart grid a widely deployed and adopted infrastructure. The panelists will seek to provide an up to date and well-rounded view of where we stand, as well as best courses of action for taking the next step. Utility managers, engineers and technicians are concerned with providing better reliability and system security while being able to quickly and efficiently access grid information and resolve system disturbances. This session examines case studies of how utilities are using new and existing technology-plus the intelligence of their personnel-to conquer these challenges. It discusses the vision of a smart grid is that is altogether connected by high-speed networks over fiber optic links and managed from a central location, allowing utility personnel to most efficiently manage the electric system with the best reliability and highest efficiency. The main focus of this is the ability to serve the customer with the highest quality service at lowest cost. We'll look at how to take advantage of the proper advancements at the right time in order to further progress toward a fully intelligent grid. The ongoing transformation of the electric grid towards a networked infrastructure introduces additional system security issues. Whether labeled a Smart Grid program, or the inevitable modernization of existing infrastructure, added layers of security standards, controls, policies, and procedures are necessary to keep control of power generation and keep transmission and distribution equipment free from growing unreliability issues and malicious acts. Terrorism, disgruntled employees, inadvertent errors, Internet pranksters or international cyber warfare can sabotage and destroy expensive equipment endangering lives across wide geographies. Security and risk management must be addressed as a high priority in smart grid projects. As utilities move into implementation of initial projects and programs in smart grid, variations on the business case for the deployment of technology have been offered. Varying widely, these business cases often focus on obtaining improved data from the network first through AMI and the expansion of SCADA capability. This session examines the proposed benefits and business models for a smart grid, including demand response, energy efficiency, renewables integration, and other "killer apps". The focus is on deployment options and case studies grounded in the reality of today's utility business while looking towards the future. Traditionally, energy production has been designed to strictly follow demand. Yet there is steadily growing interest in options for managing consumption in the electricity network. In areas with limited transfer capacity, "peak shaving" can avoid overloading the network leading to black outs. There are also situations in which demand exceeds what can be produced in economically and environmentally preferred plants. The growing amount of distributed green power generation will make it more difficult to balance other production since, for example, windmill production may shift rapidly and peak production times seldom match peak demand times. This session discusses the role of the energy gateway in addressing this situation by bringing intelligence to the borders of the grid. Online conference focusing on key smart grid advances and challenges. The one-day Summit on Thursday, March 18 will highlight the perspectives of leading utilities, technology companies, systems integrators, and regulators in making the smart grid a reality. The focus will be on the business case for smart grids, how to implement effectively, recent technology advances, standards and regulatory progress, and identifying new business opportunities.